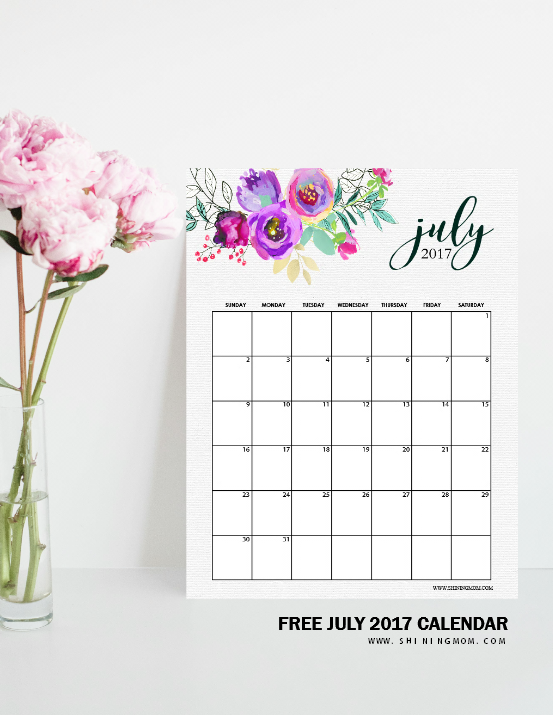 FREE July 2017 Calendar Set: 5 Gorgeous Designs to Print! 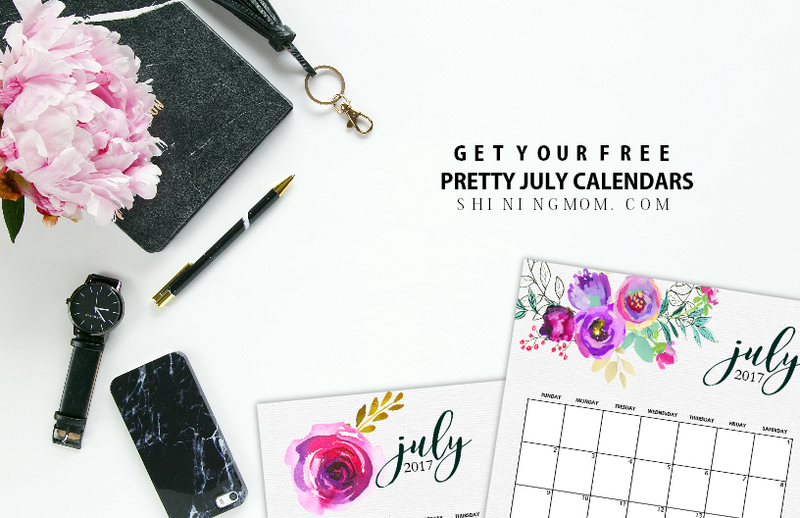 Are you here for the second release of Shining Mom’s free July 2017 calendar set? You arrived just on time! Welcome to my favorite segment on the blog, the Happy Freebie Monday, where I get to share awesome free printable planners and organizers! 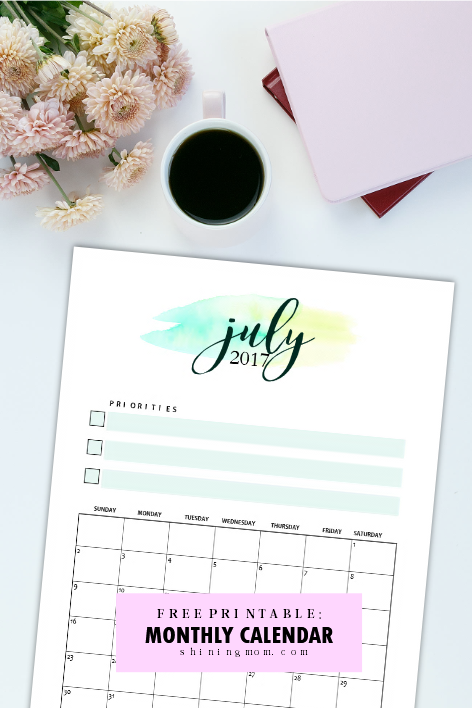 For your Monday freebie, I am beyond thrilled to share with you 5 darling calendars to help you make your July a truly awesome month. Scroll down to view the lovely designs. Oh, wait! A little sharing of my little joy here before I get going!/ Friends, I am just so blown away to see the drastic increase of my blog visits since last month. The blog traffic has doubled and even almost tripled and it’s waay beyond my expectations! Thank you, thank you for all the love! You ladies who love to hang out at Pinterest just like me– you are really helping me to grow this blog. Thanks for pinning Shining Mom images. I so love you for the warm support! As my own way of showing my gratitude, here’s another round of free calendars (the first set is here) and I think you’re also going to love them just the same. Designing tools are from my ever favorite nook for designers, Creative Market. Here’s a preview of the 3 out of 5 calendars, decide which free July 2017 calendar to print from this set. 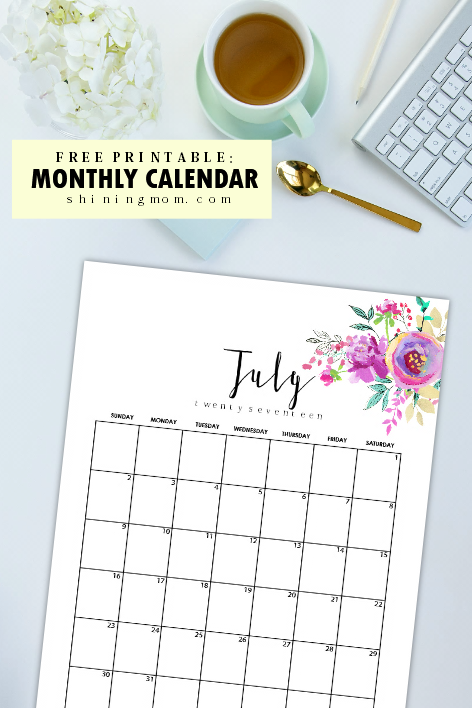 Here are the free pretty calendars for July that you can print for free! So which one is your favorite from the set? Can’t decide which one to use? Just print all of them and share with your family and friends! Choosing later on is easier that way. =) Simply hop over HERE to enjoy this free July 2017 calendar. Have you seen the free planner for July? I’m pretty sure you’ll love to see the planner that matches perfectly with these calendars, right? Let’s make July ultra productive. It’s the kind of planner that will let you lay your “musts” for the month, In case you missed the other day’s post, go HERE to get the oh-so-darling planner now. If you didn’t happen to see my recently released ultimate household binder yet, be sure to join the “binder tour” of the oh-so-loved Shining Mom flagship product, the “Every Mom’s Planner”. It has over 70 printable home organizing pages to help you organized for only $8! See the planner for yourself. I think you’ll love it! Thank you, friends! Thank you for making Shining Mom calendars part of your days! “See” you around! And oh, you might like to sign up for my mailing list to join my happy subscribers HERE. That way, you’ll never miss a Shining Mom freebie again, ever. Have a lovely July! 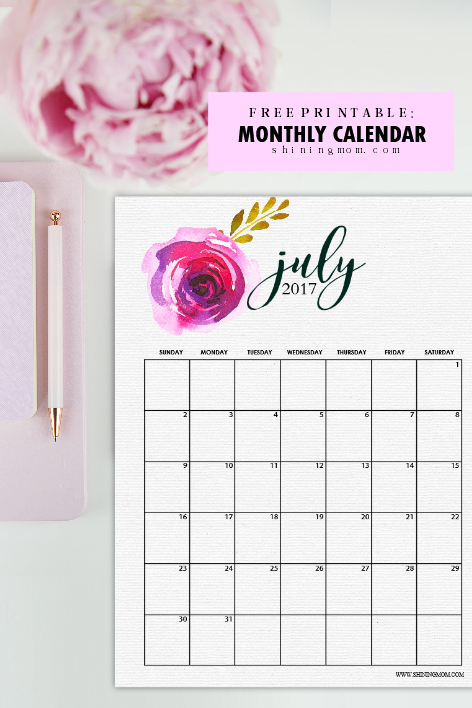 « Plan a Bountiful July: Print this FREE Beautiful Planner! I am so OVERLY obsessed with not only the calendars, but everything you create. Thank you so very much for all that you do !